Take your classroom on a virtual exploration around the world and through time with this exciting new digitally driven social studies program. 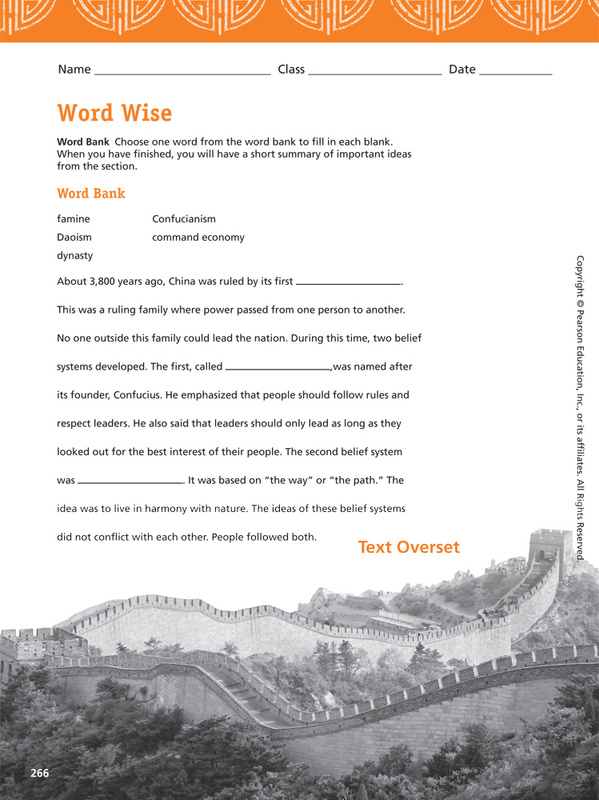 Help students develop a deeper understanding of the content by making personal connections to the people and places they learn about. 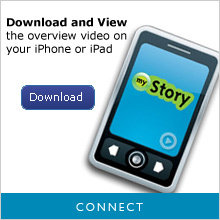 Engage students and help them make personal connections to people and places all over the world with the myStory features in the Student Edition and online. These stories are told by real teens from all over the world and have been collected by Financial Times journalists, allowing your students to connect to different cultures and regions from the classroom! Pearson has engaged author Kathleen Krull and esteemed Financial Times journalists to provide high-interest stories with an "on location" feel. These real-life stories are told by teens from around the world and begin each digital and print chapter in the geography program. These richly illustrated stories provide students with a way to make emotional and enduring connections to the content. 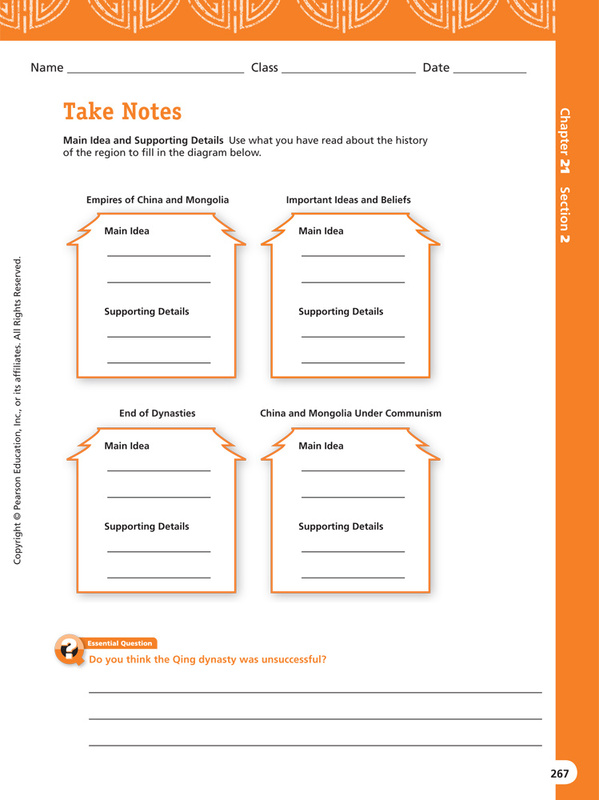 Leverage the Understanding by Design® instructional approach, developed by program consultant Grant Wiggins, to enable students to develop a deeper understanding of the geography and history of their world. 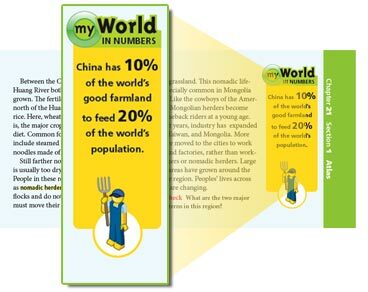 myWorld in Numbers helps students comprehend global statistics by simplifying them—similar to the popular book, If the World Were a Village. For example, "If there were one hundred people in the world, 22 would speak Chinese and 9 would speak English." 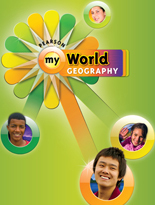 Every chapter of myWorld Geography employs the philosophy of making often abstract and difficult geography statistics accessible to middle graders. Using myWorld in Numbers, your students will make connections to data and develop the skills associated with using data to make decisions. Take students across the globe—no passport required! With innovative online resources, project-based activities, and unprecedented support for all learners, all students will go beyond the printed page and actively experience the world in which they live. Every chapter is framed around an Essential Question and the real-life myStories of the people your students will "meet" on their journey. Students connect personally to the content and develop a deeper understanding of the world's geography and its history. Innovative online resources, project-based activities, and unmatched support for all learners take your students beyond the printed page and into active experiences of the world in which they live. The Online Virtual Travel Assignment is an exciting way for students to experience world geography and world history by "taking them there" through virtual travel, storytelling, and colorful, intriguing design. Today's students are immersed in a world of media and gadgets. 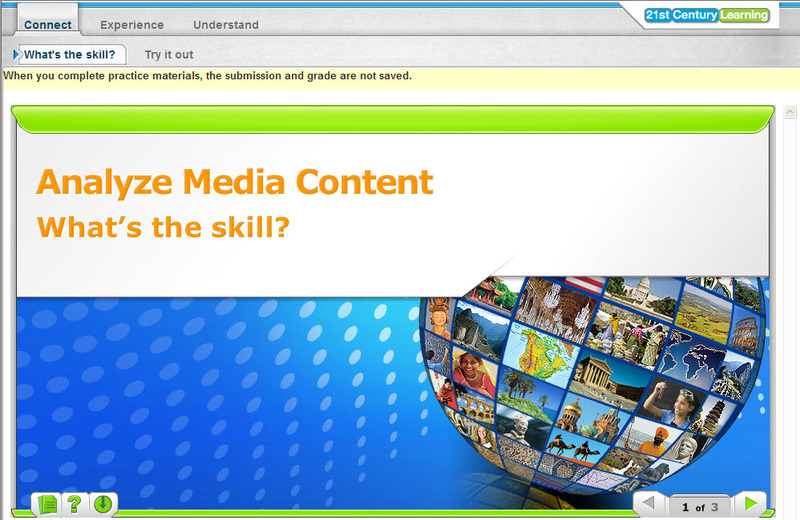 They are most motivated to learn when they can interact with and create their own digital content. The Online Travel Assignment has students travel through regions or time periods and complete a game-like assignment based on an Essential Question. 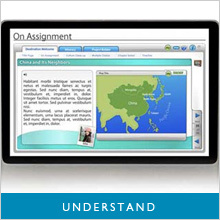 Students gather information to complete the assignment by watching video interviews and stories, working through simulations, completing animated activities, and analyzing and examining maps, data, artifacts, and primary sources. They capture their thoughts and record their observations in a PDA "tracker" and send their "assignment" directly to their teachers. 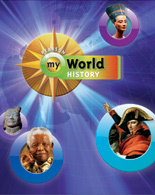 Hands-on activities are embedded in the student materials and extended through the ProGuide and the Activity Cards, Essential Question posters, and myWorld Geography wall maps. In myWorld Geography the opportunities to actively learn and collaborate with classmates are endless. Active learning inspires students to obtain an enduring understanding of the content they're studying. In addition, students regularly engaged in active learning, develop confidence and self-direction as they move through both team-based and independent work. 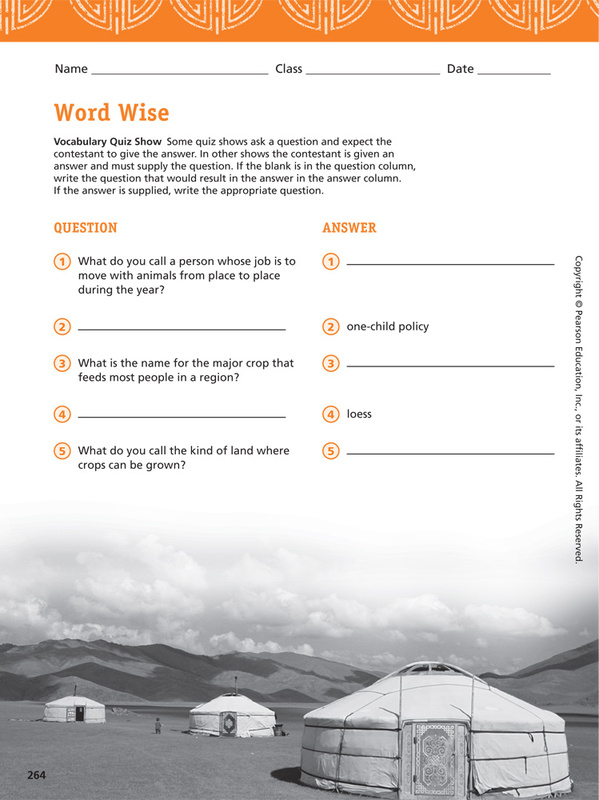 Six cards accompany the activity-based lesson plan and provide students with insight into the most influential factors on life in South America. The cards feature facts, graphs, and trends on healthcare, education, communication, industry, poverty, and deforestation in South America, all of which contribute to the region’s successes and struggles. 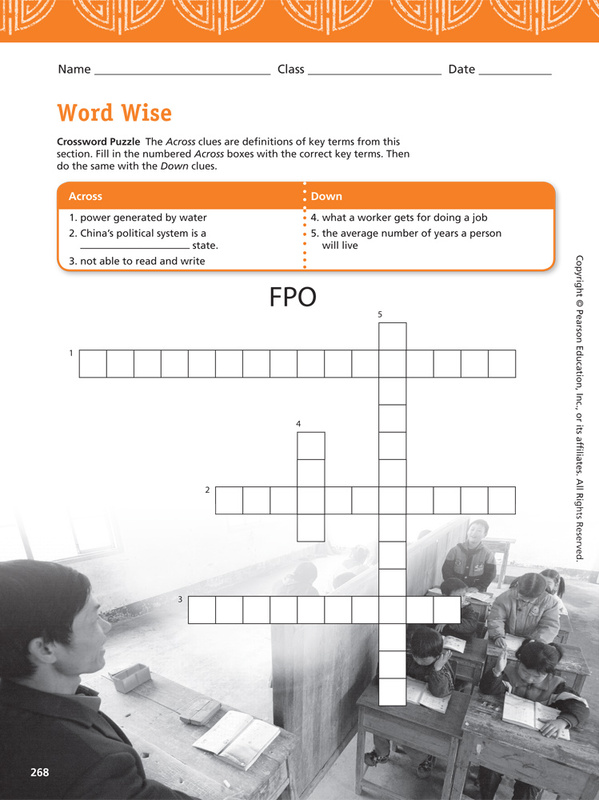 Activity-Based lesson plans embedded within the Teacher's Edition aim to achieve long-term understanding of Essential Questions for all students through individual and small-group activities. In this chapter on diversity in South America, the lesson plan recommends students divide into groups with one country in mind, read the information presented on Activity Cards, and assess a country’s need for a financial improvement to better the social structure. The lesson ensures students achieve an enduring understanding of the effects of geography and history on a country’s social and economic problems. Make sure students aren't just reading content—make sure they "get it"! In addition to the UbD approach woven throughout the program, myWorld Geography provides opportunities for students to demonstrate what they've learned so you can assess for success! 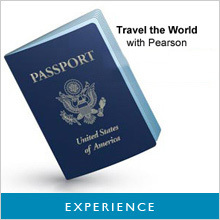 The perfect accessory for virtual world travel. 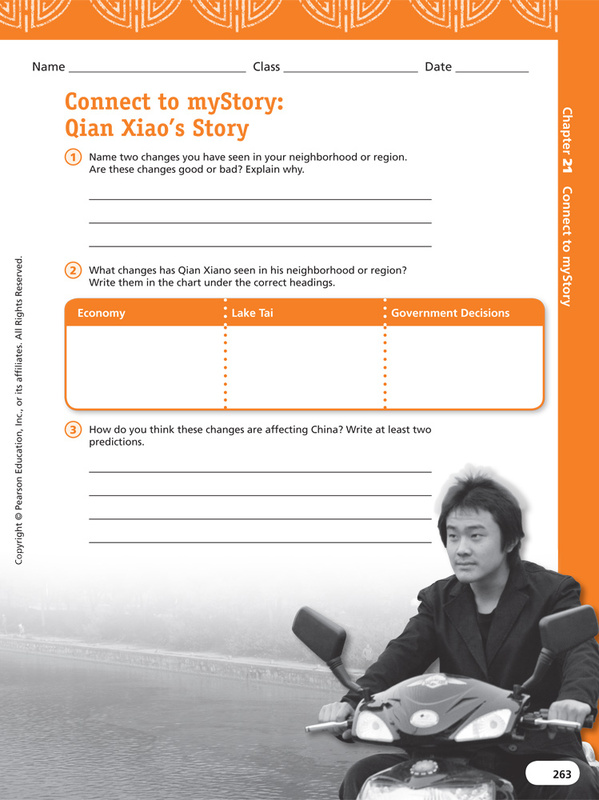 The Student Journal is a colorful, interactive student workbook that reinforces the Essential Question for every chapter in the program. The first page of each chapter's Journal is a pre-reading/previewing exercise using the Essential Question as an approach to the content. In addition to graphic organizers, chapter support in the Journal concludes with a two-page writing exercise. In line with 21st Century Learning, the Online Travel Presentation is the culminating effort of virtually trekking the world. Watch your students deliver classroom presentations showcasing their personalized experiences and the knowledge they acquired. The Online Travel Presentation has students delivering personalized presentations from their trip to another part of the world. 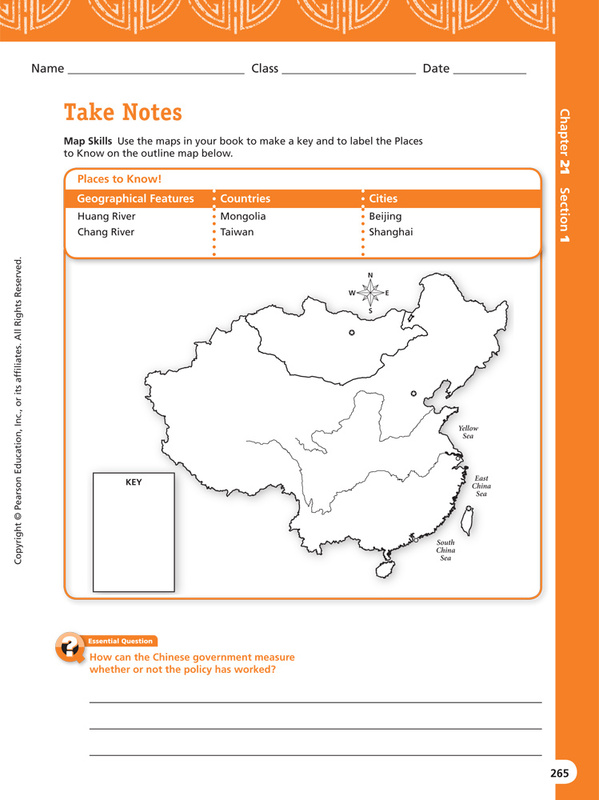 Students use a "tracker" PDA tool to collect the resources as part of their travel assignment. These assets – notes, pictures, audio, video – are organized on slide templates and become a personalized memoir of their experience. The 21st Century Learning tutor on the online digital course at SuccessNet.com goes beyond traditional social studies skills such as map, graph, and critical thinking to feature instruction, practice, and application of 21st century skills and concepts including innovation, collaboration, media, and technology.